How to Grow Corn | Grow This! Corn has been cultivated in North American for thousands of years. Though it takes its fair share of garden space, fresh picked sweet corn tastes better than anything you can find at the grocery store. While it can be slightly challenging to grow, it can also be a lot of fun. Here are some tips on how to grow corn to get you started. Corn seed packets should be labeled as on of the following: “normal,” “sugar-enhanced,” or “super sweet.” The sugar begins to change in corn as soon as it is picked, which can really hinder the flavor. For this reason, supersweet cultivars have been developed to help sustain the sweetness. These varieties are best if sweetness is the number one goal of growing corn at home. This is also helpful if you intend to store or sell the corn your grow. However, more standard varieties will provide a classic corn taste. Whichever you choose, be sure to consult local growers to see if there is a specific variety known to thrive in your area. For fresh eating only, plant to grow 10 – 15 plants per person. Plant more if you intend to store or sell it. Sow every 2 weeks for about 6 weeks for a continuous harvest. Frost will kill a corn crop that is started too early. Corn seeds should not be sown indoors and transplanted either if possible. Wait until the danger of frost has passed and soil temperatures have warmed to about 60° F. Use black plastic mulch to warm the soil if necessary. Corn will not germinate if the temperatures drop below 55° F.
Corn is well suited for growing zones 4 – 8. An extremely heavy feeder, corn grows well where clover, beans and other soil-enriching plants (any legumes) have recently grown. The corn should be protected from strong winds. Different corn cultivars should be kept separated by about 400 yards to avoid cross-pollination. Corn is not the best vegetable to transplant. Corn seeds should be sown directly into your garden whenever possible. If you have a short growing season and must get a head start on your corn by starting them indoors, use biodegradable starter pots. They can be planted directly into the ground so you won’t disturb the sensitive root structure of the seedlings. Corn needs deep, loamy and well-drained soil. Be sure the soil is well fortified with fresh compost, about 25 pounds per 100 square foot of garden. The pH should be neutral, about 6.0 – 6.8. Corn should be planted in blocks of at least 3 rows to promote good pollination. Be prepared to hand pollinate if you plant only 1 or 2 rows. Sow seeds 1 inch deep at about 3 seeds every 10 inches. Plan for about 75% of your seeds to germinate. Germination takes 7 – 10 days. Thin to 1 plant every 12 – 15 inches once they reach about 3 inches tall. Cut them off at soil level. If you pull them out by hand you may damage the other plants. Corn does not compete well with weeds. Weed very carefully for the first month only as to not disturb the delicate root structure of the corn. Use mulch after the first month to limit root competition. Corn needs about 1 inch of water per week. Water at the base of the plants only. Overhead watering interferes with the proper pollination of the tassels and can also foster disease in the foliage. Water stress, particularly as the plants flower can cause missing kernels so be sure to keep the soil consistently moist without flooding the plants or making it muddy. Corn is an extremely heavy feeder. They need nitrogen rich fertilizer. A diluted fish-based fertilizer tends to work well. Side dress them after they reach about 6 inches tall. Repeat once they reach knee high. Poorly pollinated corn will result in undeveloped and missing kernels. If you are planting enough rows in a boxed style, you will not need to worry about it. Wind will usually deposit pollen from the tassels on the top of the plants to the silks of each ear. However, if you have only 1 or 2 rows of corn, you will need to pollinate by hand. Once the silks emerge from the ears and the tassels appear loose and open, collect pollen by shaking the tassels over a container. Collect as much of the powdery substance as you can from all of the plants. Redistribute it immediately onto the silks of each ear of corn. Repeat this process for a 2 – 3 days for even better results. Corn begins to ripen about 3 weeks after the corn silks appear. Pull back the husk of one of the ears of corn and pierce one of the kernels. A milky liquid will squirt out when at peak ripeness. Ears on the same stalk should be ripe within a day or two of each other. Silks will turn completely dry, yellow or faded green once the corn is past its prime. “Ornamental” and “popcorn” varieties can be left until the first hard frost to harvest. Do not remove side shoots or suckers. They do not harm corn production and removing them can damage the plants. The most important thing for a successful corn crop is fertile soil. Consider growing a legume cover crop the season before where you intend to grow your corn. 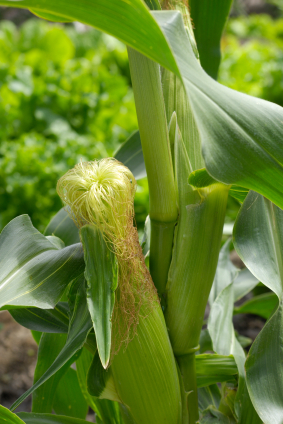 Miniature or baby corn can be planted 2 – 4 inches apart and harvested once silks emerge from the ear. If you’d like to share your tips on how to grow corn, let us know in the comments below!